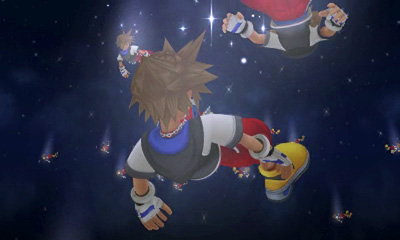 Set immediately after the events of KINGDOM HEARTS II and Re:coded, [Dream Drop Distance] is deeply connected with the mysteries surrounding all those involved in Birth by Sleep, and all which occurred in it. 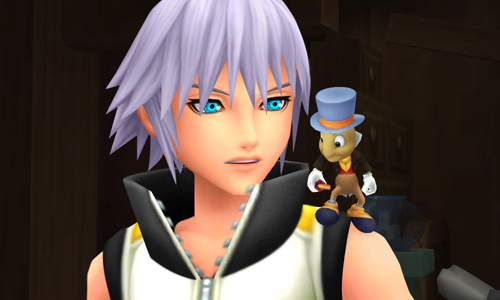 With the contents of the letter sent by King Mickey seen in the ending of Kingdom Hearts II revealed, this Nintendo 3DS title sees Sora and Riku depart to the Mysterious Tower to partake in the Mark of Mastery exam, proctored by the wise and powerful sorceror-come-master Yen Sid, overseen by His Majesty. They delve into the Realm of Sleep, in order to wake up those worlds that have drifted away in sleep and bring them back to reality. Being equipped with clothes closely based off of outfits seen in KINGDOM HEARTS II and KINGDOM HEARTS II Final Mix, the duo set off into worlds that we have seen, as well as some new additions: La Cite des Cloches (based on Hunchback of Notre Dame), Country of the Musketeers (Mickey · Donald · Goofy: The Three Musketeers), Symphony of Sorcery (Fantasia), Prankster's Paradise (Pinocchio) and The Grid (Tron Legacy). Introducing new systems such as Flowmotion and Reality Shift, as well as the depth of the 3D features of the 3DS, this title brings KINGDOM HEARTS to an entirely new level! Dreams are connected to dreams -- when you drop into a dream, you connect with the world enclosed in sleep; the world introduced in dreams. The worlds that were swallowed by darkness in the first adventure will be reborn, but within them lie worlds connected to sleep whose rebirths were incomplete. As such, gates cannot connect to them; Heartless cannot invade them. Therefore, rather than the large numbers of Heartless plaguing the Realms of Light and Darkness, there instead exists a different kind of darkness in the Realm of Sleep. The monsters that eat dreams, Dream Eaters. Ones that consume dreams and replace them with nightmares, and those who consume nightmares. In order to prepare to confront Xehanort, we need Sora and Riku to take the Mark of Mastery exam. By opening the Door to Sleep, your bodies will gain new powers and abilities, and you should be able to forge a path towards liberating the worlds enclosed by sleep and return them back to the Realm of Light. Corresponding to the number of pure hearts, if you release the "Seven" Keyholes of Sleep and return to this realm, you will be recognized as a Master.